58 million primary-school-age children are not enrolled in school; 53 percent of these are girls. These children are at greater risk for exploitation, child marriage, and lower income-earning potential. We address barriers to education and work with communities and local governments to improve the quality of education children receive. We work with WFP and USDA in Rwanda to improve children’s literacy (click above). See how Reading Clubs work here. Our All Children Reading partnership and Pearson just announced Book Boost: Access for All Challenge. Around the world, parents encourage their children to read by creating a reading corner, a comfortable spot with good light and lots of books. Learn how. Tutoring at an informal education center prepared Mohsin, a child laborer in India, to enroll in school. 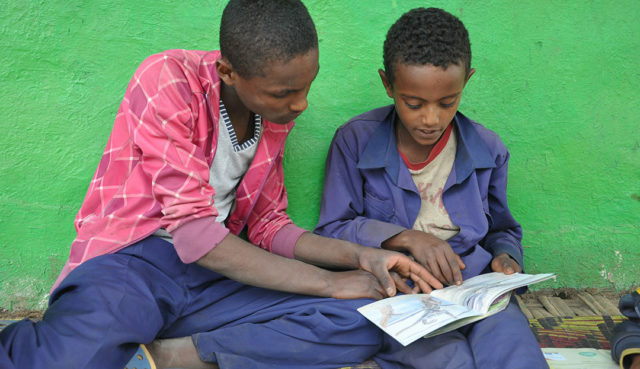 Giduma taught his siblings to read. How? Reading Buddies, a World Vision program that trains children how to read with and teach other kids how to read. teachers empowered to improve quality of education in 56 countries. parents and caregivers trained to support children’s learning. children benefitted from education programming. Why are so many children out of school or illiterate? Due to inadequate training of teachers in reading instruction, high ratios of students to teachers, insufficient teaching materials in children’s home language (mother tongue), and other issues, millions of young girls and boys around the world cannot read or write. These barriers are disturbing every child’s right to a quality education and ability to learn, grow and thrive. Girls and boys often drop out of school because they must work to help support their families, because of harmful socio-cultural norms and practices (such as child marriage) that prevent them from attending and completing school, and because policies to support children’s school completion are not well reinforced. The lack of education impacts all children, but young girls are often the worst affected, having to face risks of sexual trafficking, child marriage and gender-based violence in schools. 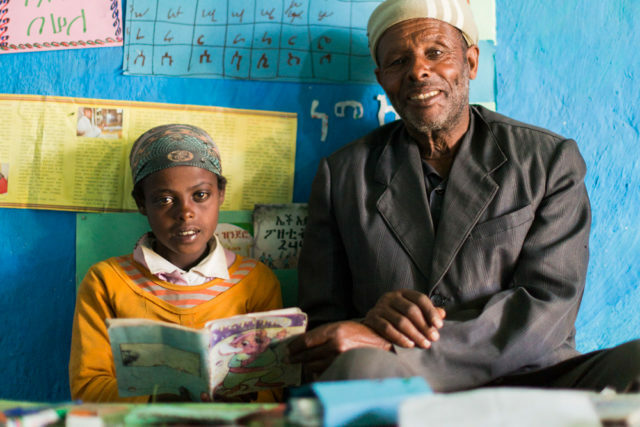 What is World Vision doing to help children gain access to quality and equitable education? 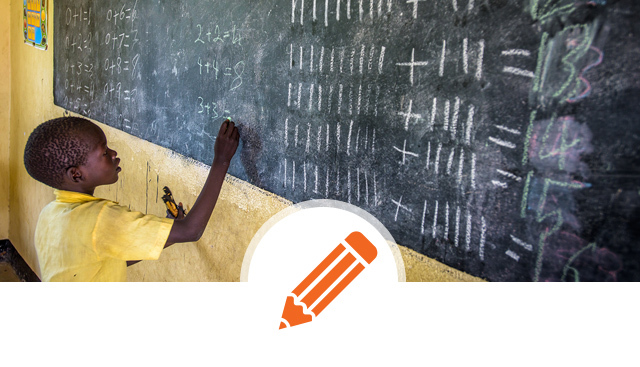 Does World Vision build schools and provide books and school supplies? If a lack of supplies and proper learning environment are barriers to education, we want to address those issues in a sustainable way. Sometimes, that means utilizing corporate or government donations of appropriate teaching and learning materials, such as library books, notebooks, and other relevant school supplies. But we strive for sustainability in all we do, so we focus on interventions like giving parents a small business loan and job training so they can support themselves and afford to send their children to school for years to come. The Ethiopians Fighting Against Child Exploitation project, funded by USDOL, provided support in addressing child labor. This global initiative from USAID, World Vision and the Australian Government is an ongoing series of grant and prize competitions that leverages science and technology to source, test, and disseminate scalable solutions to improve literacy skills of early grade learners in developing countries. Our All Children Reading partnership just announced EduApp4Syria finalists! This is a global literacy initiative from World Vision, USAID, and the Australian government. Together we offer competitive awards to organizations and universities that leverage science and technology to create and apply scalable solutions to improve early grade reading in developing countries. Your monthly gift to education gives children the opportunity to become adults who earn better wages, raise healthier, educated children of their own, and have a voice in their community. Help educate even more children by giving monthly. Raised in poverty, children sacrifice their futures for lack of school fees, textbooks, uniforms, backpacks, and pencils. Your gift will help train teachers and get a child the tools they need to fulfill their God-given potential.